He's popped the question. You've chosen a date. And now, you're swimming in a sea of euphoria with no horizons. Good thing, too, because there are literally a thousand things to arrange before the big day. What did his parents do? He might be surprised at the question, but it could lead somewhere valuable. 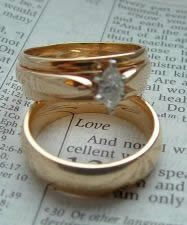 He might ask his parents about their wedding, and find your wedding consequently enriched. Look through their wedding album together. Are his ancestors German, Polish, Italian, Croatian, Asian? Incorporate some old-world traditions into your ceremony.